Full Days on the River: We begin early the first day and return late afternoon on the last day. This allows for more hiking, relaxing and river time to increase your vacation enjoyment. Camping Gear: Including a deluxe Sleeping Kit (clean sleeping bag & thick pad), and a high quality clean 2 person tent. One smaller day bag and one larger bag for clothes and other items. More dry bags are available upon request. 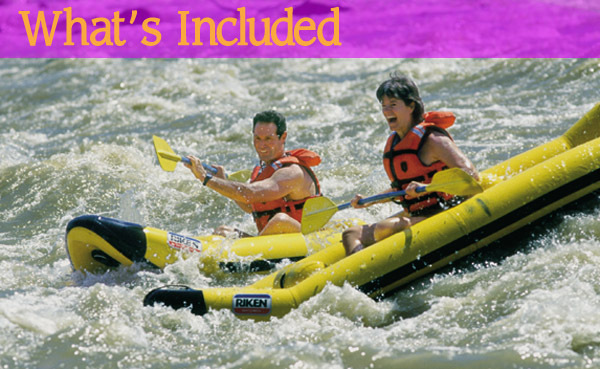 All Rafting & Safety Equipment: We provide high quality state of the art Rafts and related rafting equipment. This includes lifejackets, rafting safety equipment, full kitchen and dinning setup, and toilet equipment. HIKING: All our trips offer experiential experiences and wonders just off the rivers edge. Short walks or longer, more difficult hikes (all optional). Highly Experienced, Professional, and Licensed Guides: Trained in the art of river running. All guides are licensed, have Emergency Medical Response, CPR and river rescue training. Few companies train this extensively. Their knowledge and skills will entertain and make you feel comfortable. 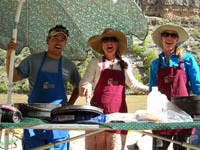 Sheri Griffith Expeditions is very proud of the skills our guides have, along with their ability to row the most technical rapids on the Colorado River and then create an unbelievable meal in camp that night. All High Quality and Quantity Meals: Beginning with lunch the first day through lunch the last day. Many of our fruits and vegetables are grown locally. Hors d’oeuvres are served nightly. Every meal is balanced and there is always plenty. Our meats and cheeses are purchased from our local meat shop that focuses on the highest quality ingredients. 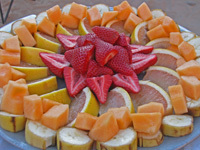 We accommodate different diets and food restrictions and make special plans for anniversaries, birthdays, etc. Just let us know. Our preparation and food storage techniques adhere to national health and safety regulations. Iced Coolers on boats: Provided specifically for personal beverages that you would like to bring. There is plenty of room, but please no glass. Lemonade, Gatorade and Water Available All Day: Coffee, teas, hot cocoa, and juice available in camp. Iced drinks: After the trip for return to Moab. 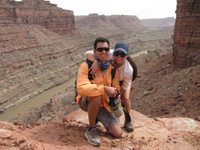 Transportation: Land transportation from Moab to the river and back. Majestic Canyons trips include a charter airplane flight to the launch site, and Cataract Canyon trips include a charter airplane flight option for the return to Moab. If small planes aren't your thing, ask about our car shuttle options.